(For Immediate Release): The Association of Procurement Technical Assistance Centers (APTAC) is pleased to announce that it has entered into a Memorandum of Understanding (MOU) with the U.S. Department of Commerce (DOC) National Institute of Standards and Technology’s (NIST’s) Hollings Manufacturing Extension Partnership Program (MEP) for the purpose of establishing collaborative efforts to support the U.S. manufacturing industrial base. Such collaboration will result in more efficient use of U.S. tax dollars to increase competition for government contracts, thereby expanding the government’s industrial base and improving U.S. manufacturing’s productivity, economic competitiveness, and technological capabilities. Terri Bennett (left) and Carroll Thomas sign the MOU. 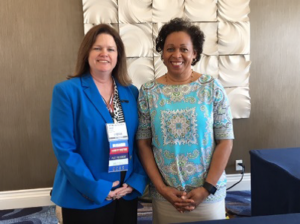 The MOU was signed on April 11, 2017, by APTAC President Terri Bennett and MEP Director Carroll Thomas at APTAC’s Spring Training Conference in San Diego, California. More than three hundred PTAC professionals were in attendance. Both the Procurement Technical Assistance and Manufacturing Extension Partnership programs are federally funded to provide manufacturers with information and resources needed to be successful. The MOU outlines key focus areas where the two programs can collaborate for the mutual benefit of their missions and U.S. manufacturers, formalizing a partnership whereby technical assistance can be provided to businesses and industry, allowing small businesses – especially small manufacturers – to play a greater role in strengthening the U.S. economy. Under the terms of the MOU, the organizations will foster greater communication, cross-referrals, understanding of each other’s services, and collaboration on small business events among PTAC and MEP offices across the country. 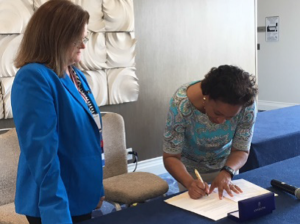 Additionally, the PTACs will serve as a conduit to ensure that NIST developed cybersecurity and other resources reach the small business government contractors who need them. The MOU is effective immediately and will remain in effect for five years. It may be extended by mutual agreement.